Until now wide area IP surveillance security has always been the most technically problematic to deliver and has placed the greatest strain on resources to support. PTZ Camera installations needed to be controlled and monitored by surveillance operators in order to monitor and point them in the right direction. Security organisations around the world spend millions each year, many with large numbers of permanent staff, trying to collect suitable IP surveillance images, searching through days or even months of video for just a few seconds of crucial evidence. The vast majority of these efforts result, daily, in lengthy reports as to why the evidence available could not be used because the incident did not occur close-up to the camera, or was missed completely because the PTZ Camera was pointing the wrong way. Viseum UK supplies the only Intelligent IP surveillance camera and IP PTZ Camera in the world to automatically detect all activity in all directions at the same time, automatically control pan, tilt and zoom (PTZ) cameras to zoom into and follow the required action, capture high-quality close-up and wide contextual view video evidence; and automatically produce it for rapid investigations. At the heart of all our IP surveillance camera and IP security camera, solutions are the patented Viseum Panoramic Security Camera. This uses multiple fixed cameras and one moving PTZ surveillance camera in a single unit, with advanced software called Viseum Virtual Operator, to detect, zoom into and follow all suspects no matter where they each enter, circulate or leave the site. It is modular hardware configured to cover a targeted area or provide vast simultaneous full 360° panoramic automated coverage, up to the size of 4 Olympic Stadiums from just one IP surveillance camera installation. 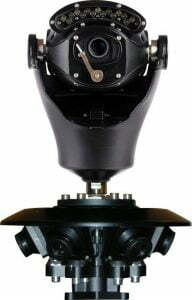 It has been independently endorsed that it would take at least 6 times more installations of any other advanced IP surveillance PTZ camera solution, or at least 10 of the industry’s latest panoramic megapixel cameras, or a minimum of 200 times more standard fixed camera installations, to provide the level of security that each Viseum outdoor surveillance camera provides without being dependent on any surveillance operators or IP surveillance infrastructures.